The Greyhounds placed by adoption organizations like ours are generally retired, trained athletes. 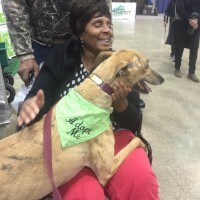 Although Greyhound adoption organizations may very infrequently have Greyhound puppies or dogs that have never been trained for the track, these are much more the exception than the rule. Greyhounds are generally bred by professional breeders who look for speed, endurance and even temperament. Most are bred on “farms” located throughout the country where the breeders pay close attention to the physical soundness and emotional disposition of the puppies. As a result, hereditary physical and temperament problems have been avoided in the breed. For the first year of their lives Greyhound puppies live together with their litter mates and are handled frequently by the breeders and other staff associated with the breeding “farm,” but they are not exposed to other breeds of dogs. Consequently, they are surprisingly socialized to people and strangers but not to other breeds of dog. 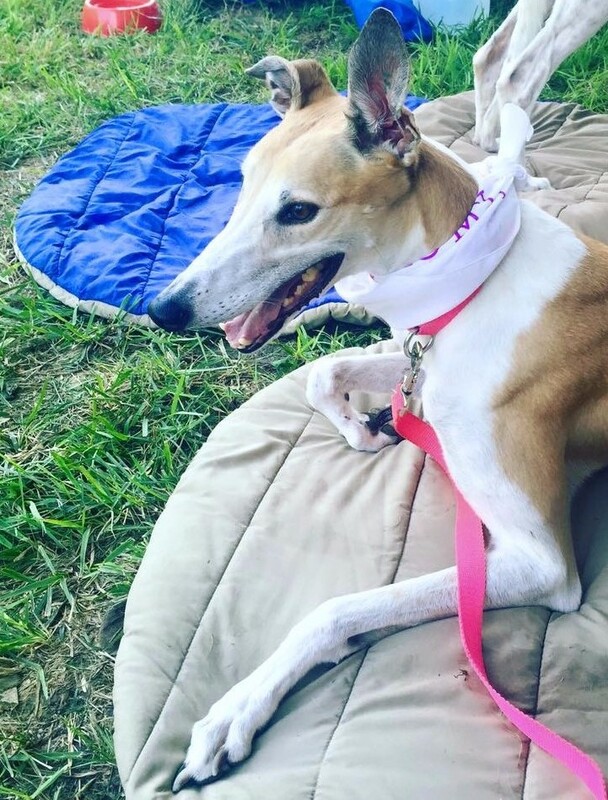 Basically a Greyhound is like all other dogs, but because of its training and racing career has some unique characteristics. Greyhounds, like all other dogs, are pack animals which means that they are social creatures who live in a social hierarchy. This socialization is particularly strong with Greyhounds because they have been in the company of a large numbers of other dogs from birth. They need to know who the “alpha” figure, the pack leader, is so that they know how to behave. The “alpha” figure sets the rules, enforces discipline and is responsible for the safety, health and well being of the pack. There is always competition and testing in a pack for taking over the role of leader; the strongest member leading the pack insures its survival. As a pet, your dog will look to you to be the “alpha” figure. One of the first behaviors you will probably notice is your new dog following you from room to room looking to you for leadership. If you do not fill the role of the “alpha” figure in terms your dog can understand, it will be perfectly willing to take over if it is allowed. Most dog behavior problems arise out of an owner’s misunderstanding of the proper role of the pack leader. Among the more common problems arising out of a misunderstanding of the leader role is the reinforcement of shy insecure behavior by trying to avoid all distressing situations in an attempt to comfort an insecure dog. There are several very good books available on dog behavior. We recommend that you consult your veterinarian or a qualified dog trainer for specific recommendations. A Greyhound is a sight hound descended from southern wolf strains and related to Afghans, Salukis and other sight hounds. As hunters they work cooperatively with other hounds and develop strategies of pursuit spontaneously during the chase. This characteristic can be seen in the independent behavior frequently exhibited by even the best trained show Greyhounds in obedience competitions. Although they have exceptionally keen eyesight, Greyhounds also have keen hearing and sense of smell. Retired race dogs have been trained to chase lures, usually mechanical but sometimes live. They are NOT vicious predators as many believe, but chase things that move by nature. It is the Greyhound’s nature to run. They are sprinters who can run up to 45 miles an hour for very short periods. Some of them love to run; others are simply not interested after they retire. In spite of their early training for the race track, Greyhounds love people, in fact more than most breeds, and tend to be quite sociable. They have been handled a great deal during their early years by dog walkers, trainers, veterinarians and others. Many trainers are women who bring their children to work, so the dogs frequently have been exposed to children of all ages. Generally, Greyhounds are quizzical, sometimes shy, very sensitive and surprisingly gentle. They possess superior intelligence, and can exhibit a quiet but surprising independence. These are not animals whose spirit have been broken by their training or racing experience. 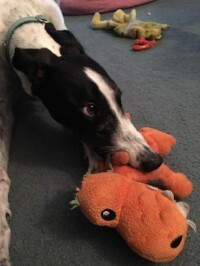 Because of their early training, retired Greyhounds have never been without the company of other Greyhounds and have never had the opportunity to really be a puppy. They may need to act out some puppy behavior, like chewing, which they typically quickly outgrow. They are anxious to please and can be trained to standard obedience commands with patience and consistency. They are used to a leash, love to walk and will learn to heel quickly. 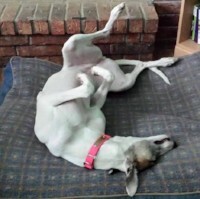 Most Greyhounds do not know how to sit, climb stairs or play games only because they have not yet learned. With time they can learn all of these things. Greyhounds have never been exposed to other breeds of dogs. 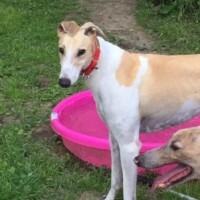 They know other Greyhounds but may be perplexed, frightened or simply ignore other breeds. They do not know cats. Greyhounds do not know how to defend themselves except by flight and will often “freeze” if attacked. Greyhounds are used to traveling and adapt quickly to riding in cars. Greyhounds do not typically bite but sometimes show affection as a wolf does with mouth agape, gently grasping. They will lick your hand, too. They show affection with their whole body and may rub up like a cat or lean against you. Greyhounds have no fat layer on their bodies which makes them sensitive to winter cold or rain. If outside for more than a short time in bad weather, they should be protected with a coat. No dog should be left outside in the cold. They are not barkers by nature, but will bark if excited or trying to tell you something like needing to go out. Sometime between four and eighteen months, they generally are placed in individual crates in the kennel where they spend most of their time between exercise periods and training. The crates become the dog’s private, safe space where they cannot be bothered by other dogs. Generally, Greyhounds are not abused or mistreated, although their handling is straightforward and utilitarian. They do not always get anything in the way of attention or handling that is not needed as a part of their training for the track. 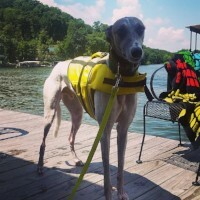 Text by The Greyhound Project, Inc.